Share market Highlights: Sensex and Nifty ended with strong gains on positive global cues, helped by a rally in Kotak Mahindra Bank shares and consumption stocks. The 30-share Sensex closed at 35,673.25, up by 362 points, while the broader Nifty 50 closed just shy of 10,700-level. Share market Highlights: SGX Nifty futures was trading 67 points higher at 10,691, indicating a positive start for the Sensex and the Nifty. Share market Highlights: The headline indices- Sensex and Nifty- ended Friday’s session with strong gains on positive global cues, helped by a rally in Kotak Mahindra Bank shares and consumption stocks. The 30-share Sensex closed at 35,673.25, up by 362 points, while the broader Nifty 50 closed just 7 points shy of 10,700-level. Sensex ened the day's session with a gain of 361 points, breaking a three-day falling streak driven by strength in global equities, sliding crude prices, recovering rupee and a surge in Kotak Bank shares on reports that Berkshire Hathaway was planning to pick up stake in the lender. The BSE Sensex rallied 361.12 points, or 1.02 per cent, to close at 35,673.25. Similarly, the broader NSE Nifty jumped 92.55 points, or 0.87 per cent, to 10,693.70. Kotak Mahindra Bank was the biggest gainer on both the indices, ending nearly 9 per cent higher following reports that Warren Buffett's Berkshire Hathaway Inc was planning to pick up stake in the private sector lender. The headline indices- Sensex and Nifty- ended Friday's session with strong gains on positive global cues, helped by a rally in Kotak Mahindra Bank shares and consumption stocks. The 30-share Sensex closed at 35,673.25, up by 362 points, while the broader Nifty 50 closed above the 10,700-level. Shares of private sector lender Kotak Mahindra Bank rallied more than 13% intra-day after CNBC TV18 reported that billionaire Warren Buffett-led Berkshire Hathaway is eyeing a 10% state in the bank. However, the shares paired gains, and closed 9% higher after the bank clarified on the exchages that it is not aware of any such plans by Berkshire Hathaway. We take a look at the live heat map. Mutual funds' asset base rose to a little over Rs 24 lakh crore by November-end, an increase of 8 per cent from the preceding month, on strong inflow in liquid schemes. According to Amfi data, the asset under management (AUM) of the industry, comprising 42 players, climbed from Rs 22.23 lakh crore at the end of October, to Rs 24.03 lakh crore in November-end. The total asset base of all the fund houses put together was Rs 22.79 lakh crore in November last year, PTI reported. Shares of India's infrastructure major Larsen and Tuobro jumped on Friday after the firm announced that its construction arm has won orders worth Rs 2,547 crore in the domestic and international markets. L&T share price gained more than 1.6% to intra-day high of Rs 1,402.45. "L&T's power transmission and distribution business has secured orders worth Rs 2,547 crore. On the international front, the business has won a major order in Tanzania for the construction of a 220 kV (kilo volts) transmission line between Dar es Salaam and Morogoro, which in turn will help electrification of a standard gauge railway line," the engineering and construction major said in a BSE filing. The 30-share Sensex continues to hold on to morning gains, with a rally in consumer stocks. Asian Paints, Bajaj Auto, Maruti Suzuki shares are all trading with gains of more than 1.5% each. Kotak Mahindra Bank shares have reversed gains after the lender issued a clarification to the exchanges saying that it is unaware of any plans by Berkshire Hathaway to buy a 10% stake in the company. Kotak Mahindra Bank said in a statement on the exchages that it has nothing to report to the exchanges on the news item that appeared on CNBC TV18. A look at the live heat map. Kotak Mahindra Bank has clarified that it is unaware of any plans by Berkshire Hathaway to buy a 10% stake in the company. Kotak Mahindra Bank said in a statement on the exchages that it has nothing to report to the exchanges on the news item that appeared on CNBC TV18. Earleir, the channel had reported citing sources that Warren Buffett is eyeing a 10% stake in the bank. Berkshire Hathaway may Look to invest $4-6 billion in Kotak Mahindra Bank - CNBC-TV18 said citing sources. Berkshire Hathaway may look at buying promoter stake via preferential allotment to invest in Kotak Mahindra Bank, CNBC-TV18 reported citing sources. The channel further reported the channel adding that it is awaiting response from Berkshire Hathaway. Kotak Mahindra Bank which had advnanced 13% on the news to intra-day high of 1,345.95, slipped to about 1,251.55. 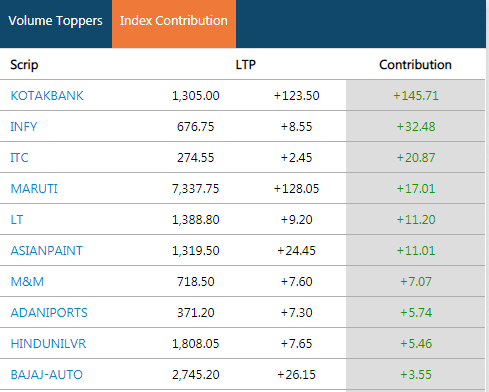 While Kotak Mahindra shares are leading the Sensex rally contributing about 145 points, shares of IT major Infosys and India's largest automaker Maruti Suzuki rallied, emerging as top Sensex gain contributors. Infosys share price rallied by more than 1.7% to Rs 679.5. The firm announced yesterday that it has hired more than 7,000 American workers in the last 18 months as a part of its ongoing commitment to accelerate the pace of digital innovation for American enterprises. Maruti Suzuki share price gained as much as 1.5% to Rs 7,349.95. A look at top Sensex contributors. The Supreme Court has issued notice to the Enforcement Directorate (ED) on former 'king of good times' Vijay Mallya's plea challenging the ongoing proceedings in a Mumbai court to declare him fugitive economic offender. A bench comprising Chief Justice Ranjan Gogoi and Justice S K Kaul sought the probe agency's response on the plea against the ongoing trial before a special court under the money laundering act. The ED moved the special court seeking to declare the London based industrialist a fugitive economic offender under the Fugitive Economic Offender Act 2018, PTI reported. The benchmark index Nifty 50 has erased morning gains and is up about 20 points at 10,620.55. 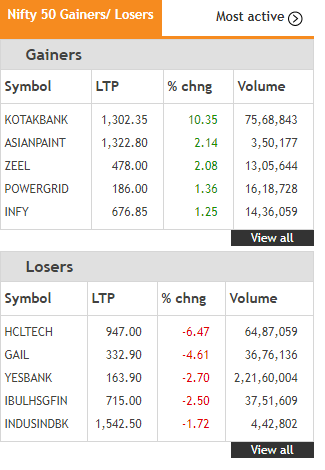 HCL Tech, Yes Bank emerged among top losers in the Nifty. HCL Technologies share price fall as much as 7.7% to Rs 934.45, their biggest single-day pct loss since May 3. At day's low, the shares have also registered a 5 month low. HCL Technologies, India’s third-largest information technology services company, has agreed to acquire some software assets from IBM for $1.8 billion, in one of the biggest acquisitions by an Indian IT firm. Yes Bank share price plunged nearly 4% to day's low of Rs 162. A look at top 10 Nifty losers. The Maharashtra government has told the Bombay High Court that it has ordered demolition of fugitive jeweller Nirav Modi's illegal bungalow built along the beach at Alibaug in adjoining Raigad district. Government counsel advocate P B Kakade told a bench of Chief Justice Naresh Patil and Justice M S Karnik on Thursday that it had served demolition notices to another 58 private properties in the area constructed in violation of the state's rules and coastal zone norms, PTI reported. The differences between Singh brothers, former promoters of healthcare major Fortis Healthcare Limited, took an ugly turn after elder brother Malvinder Singh alleged that his younger brother Shivinder Singh assaulted him, several media reports said. The incident happened at their Hanuman Road office, New Delhi, on Thursday evening. “Today is December 5, 2018. A little after 6 pm. Shivinder Mohan Singh assaulted me, he physically hit me. He hurt me. He injured me. He broke the button. He bruised me…kept threatening me and refused to budge until the team here came together and separated him from me,” said Malvinder Singh in a half a minute video, while showing his bruises. However, hivinder Singh denied the allegations, adding that, in fact, it was Malvinder Singh who hit him, according to an ET Now report. Shares of India's major private sector lender Kotak Mahindra Bank emerged as the top gainers in Nifty on Friday morning, on a media report that legendary investor Warren Buffett is eyeing a stake. Kotak Mahindra Bank share price jumped by more than 10.3% to Rs 1,302.35. Warren Buffett is eyeing a 10% stake in the bank. Berkshire Hathaway may Look to invest $4-6 billion in Kotak Mahindra Bank - CNBC-TV18 said citing sources. Berkshire Hathaway may look at buying promoter stake via preferential allotment to invest in Kotak Mahindra Bank, CNBC-TV18 reported citing sources. However, Kotak Mahindra Bank has not made any comments yet about the deal, reported the channel adding that it is awaiting response from Berkshire Hathaway. We take a look at top 5 Nifty gainers and losers. The Sensex is still up about 200 points, and Kotak Mahindra Bank shares have emerged as the top gainer in the index. Kotak Mahindra Mahindra Bank share price saw a sudden spurt of 7.9% intra-day to Rs 1,275 on reports that legendary bilionaire investor Warren Buffett is syeing a stake in the bank. Berkshire Hathaway may Look to invest $4-6 billion in Kotak Mahindra Bank - CNBC-TV18 said citing sources. Berkshire Hathaway may look at buying promoter stake via preferential allotment to invest in Kotak Mahindra Bank, CNBC-TV18 citing sources. We take a look at live heatmap. Shares of India's major private sector lender Kotak Mahindra Bank rallied on Friday, after reports suggested that legendary bilionaire investor Warren Buffett is syeing a stake in the bank. Kotak Mahindra Bank share price gained more than 5.6^ to intra-day high of Rs 1,258.75. According to a report by CNBC TV18, Berkshire Hathaway is eyeing a minimum 10% stake in Kotak Mahindra Bank, and may look to invest $4-$6 billion, the channel reported citing sources. Gold prices edged higher on Friday and were on track for their best week in 15, as the dollar weakened on renewed speculation of an imminent pause in the U.S. Federal Reserve's tightening cycle. Markets now await U.S. nonfarm payrolls data, expected at 0830 ET (1330 GMT), for clues about the health of the world's biggest economy which could influence monetary policy. Non-farm payrolls for November are expected to fall by 200,000 jobs, Reuters reported. Shares of India's IT major Infosys rallied in trade on Friday morning after the firm announced inauguration of its new technology and innovation hub in Hartford in the US. Infosys share price gained more than 1.6% to Rs 679.5. The firm announced yesterday that it has hired more than 7,000 American workers in the last 18 months as a part of its ongoing commitment to accelerate the pace of digital innovation for American enterprises. "The Hartford hub...will help Infosys work more closely with its clients in the region and will serve as the global Hub for Infosys' InsurTech and HealthTech efforts. The hub will feature living labs for the future of insurance, the future of healthcare and the future of manufacturing amongst others," Infosys said in a BSE filing. Power company NTPC is likely to acquire the Central government’s stake in SJVN Ltd, an official said. However, the acquisition deal is stuck because of resistance from the Himachal Pradesh (HP) government, the official added. The transaction would fetch the exchequer about Rs 6,700 crore at current market prices. SJVN is a joint venture between central government and Himachal Pradesh government, with the Centre holding 63.79 per cent stake and the latter holding 26.85 per cent at the end of September. The rupee appreciated by 46 paise to 70.44 against the US dollar in early trade Friday at the interbank foreign exchange, amid weakness in the greenback against some currencies overseas and a higher opening of domestic equities. Forex traders told PTI that increased selling of the American currency by exporters and banks and sustained foreign fund inflows also supported the domestic currency. At the interbank forex market, the rupee opened higher at 70.58 and rose further to quote at 70.44, showing a rise of 46 paise over its previous close. On Thursday, the rupee fell by 44 paise against the dollar to close at 70.90. Shares of oil majors IOC, BPCL and HPCL gained in the morning trade on Friday on the back of falling global crude oil prices amid the ongoing OPEC meet. IOC share price gained more than 1% to hit the day's high at Rs 133.60. BPCL shares jumped 1% to Rs 330.95, while HPCL shares rallied 1% to Rs 2278.05 on BSE this morning. Oil prices fell on Friday, pulled down by OPEC’s decision to delay a final decision on output cuts, awaiting support from non-OPEC heavyweight Russia. International Brent crude oil futures fell below $60 per barrel early in the session, trading at $59.50 per barrel at 0144 GMT, down 56 cents, or 0.9 percent from their last close. Shares of IT major HCL Technologies plunged on Friday morning, after the firm announced acquisition of select IBM assets. HCL Tech share price plunged as much as 5% to intra-day low of Rs 958.15. HCL Technologies, India’s third-largest information technology services company, has agreed to acquire some software assets from IBM for $1.8 billion, in one of the biggest acquisitions by an Indian IT firm. As part of the deal, HCL is buying IBM’s seven businesses focused on markets such human resources and as e-commerce, the company said in a statement, adding that software products it is buying represent a total addressable market of more than $50 billion. The headline indices- Sensex and Nifty- opened higher on positive global cues, following the OPEC meet and US Federal Reserve's signal to pause rate hikes. The 30-share Sensex rallied about 200 points on open to 35,540.49 while the Nifty 50 opened above the 10,650-mark. Shares of Reliance Industries jumped about 1% in the morning trade. We take a look at live heatmap. Oil prices fell on Friday, pulled down by OPEC’s decision to delay a final decision on output cuts, awaiting support from non-OPEC heavyweight Russia. International Brent crude oil futures fell below $60 per barrel early in the session, trading at $59.50 per barrel at 0144 GMT, down 56 cents, or 0.9 percent from their last close. U.S. West Texas Intermediate (WTI) crude futures were at $51.24 per barrel, down 25 cents, or 0.5 percent. The dollar struggled to recover against its key rivals in Asian trade Friday, hobbled by renewed speculation of an imminent pause in the Federal Reserve's tightening cycle, perhaps as soon as it delivers a widely expected rate hike later this month. Of particular concern for dollar bulls has been the recent sharp falls in U.S. treasury yields, with an inversion of the yield curve signalling a sharp economic slowdown or even a recession down the road. Asian shares fought to sustain the slimmest of recoveries on Friday amid speculation the Federal Reserve might be “one-and-done” with U.S. rate hikes, while oil fell anew as producers bickered over the details of an output cut. MSCI’s broadest index of Asia-Pacific shares outside Japan nudged up 0.4 percent, though that followed a 1.8 percent drubbing on Thursday. Share market on Thursday: The domestic stock markets witnessed a very choppy session on Thursday, with the 30-share Sensex plunging 572 points and the broader Nifty 50 ending near 10,600 on the back of a negative cues and a vicious selloff in global equities. Benchmark equity indices cracked for the third consecutive session yesterday, as the Sensex plunged 572.28 points, or 1.59 per cent, to close at 35,312.13. Similarly, the broader NSE Nifty fell 181.75 points, or 1.69 per cent, to 10,601.15. Sectorally too, all indices on the BSE and NSE ended in the red, led by metal, oil and gas, pharma and financial stocks.